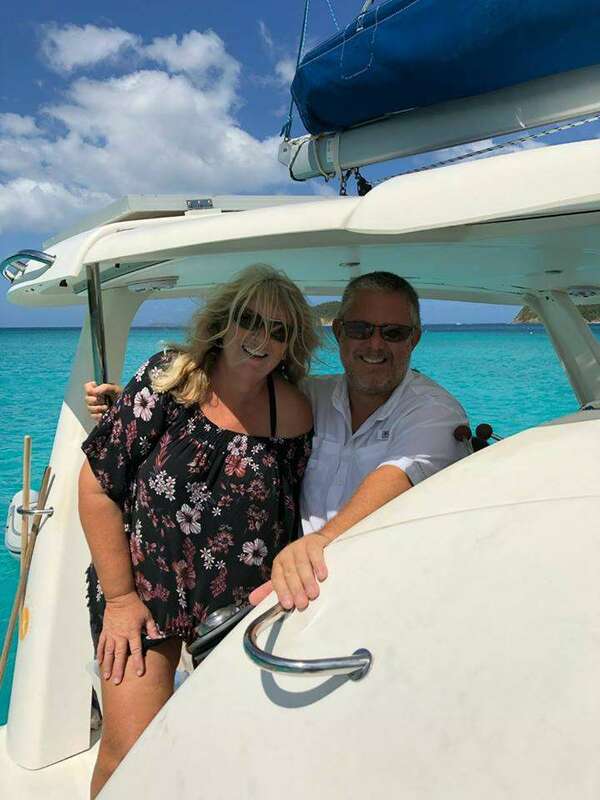 Tresa and Philip focus on guest comfort through several new upgrades and classic Leopard catamaran design. Numerous upgrades, through a recent refit, have been completed. There is a 40″ TV with 1000+ movies, AT&T Wi-Fi, high volume ice maker, digital R/O water maker, generator and electric heads. Guests are welcomed to use their Bluetooth to connect to the new Fusion stereo system which includes 4 interior and 4 exterior speakers. 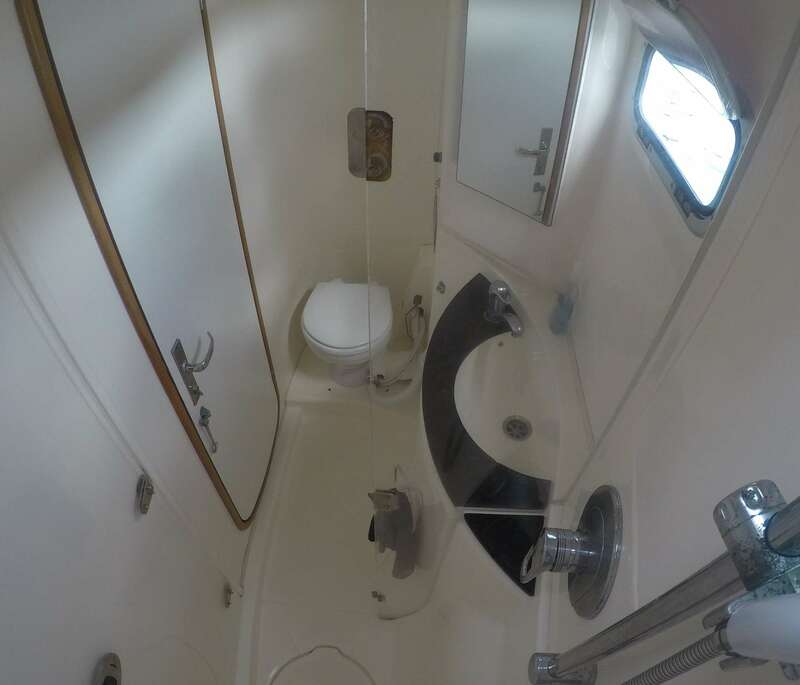 Cabins are equipped with A/C outlets for guest convenience and there are 12 USB charger ports in the salon, cockpit and cabin. Cruising speed of 6 knots is achieved through sail or 8 knots with 2 new Volvo 40 horse engines. Newly purchased snorkel gear and water beach toys such as a Yamaha sea scooter sub wing ensure fun water play. 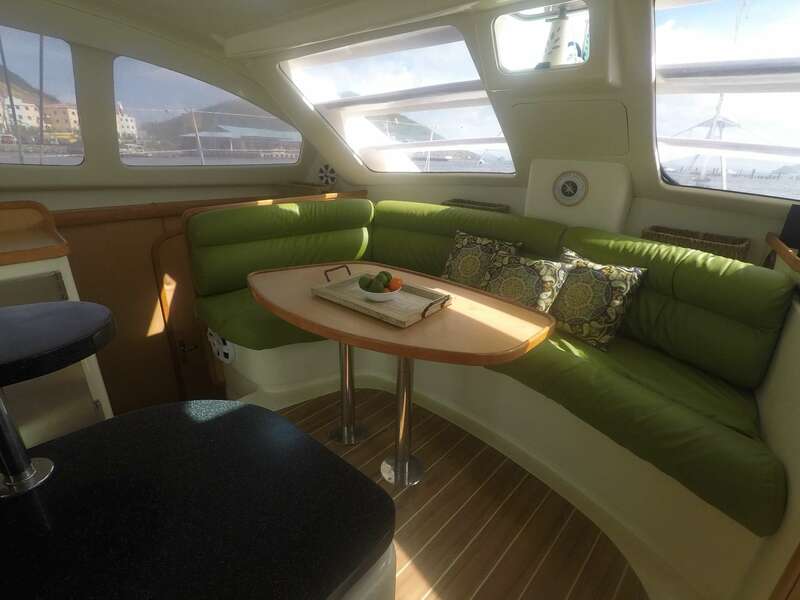 Three comfortable berths have been reserved for guests. They have air conditioning, reading lights, robust fans, hanging lockers, compartment stowage areas, shelving and mirrors are provided in each sleeping area. 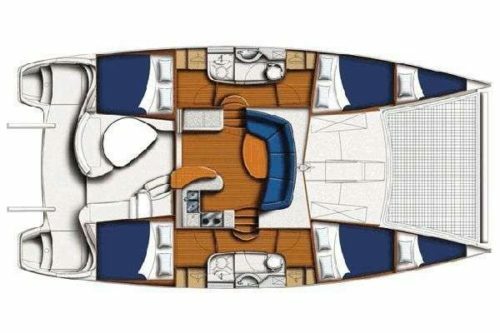 The bow staterooms include an additional twin berth area for sleeping or luggage storage. Two dry heads, each with separate enclosed shower area, are clean and odor free with plenty of hot water supplied by the water maker and generator. The electric toilets are fresh water flushed. 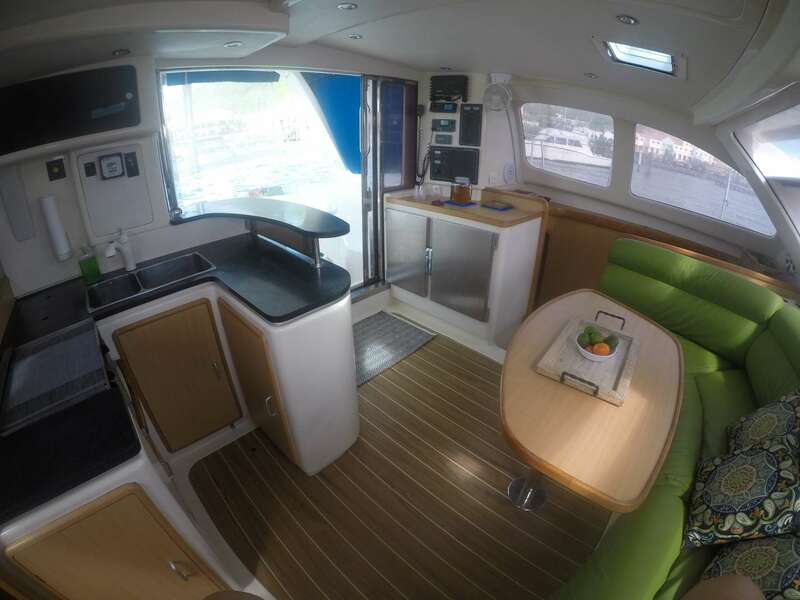 Outside living space flows easily between the cockpit and the bow. Some guests have even elected to sleep on the inviting trampoline after star gazing! BABY FRIENDLY YACHT: Babies of all ages welcome, inquire for terms and rates. KIDS SPECIAL: $100 discount per child per week, maximum 3 children’s discount per charter. SLEEP ABOARD: 6 night minimum, at $200 per cabin. Sleep aboard the night before charter dates. Boarding after 4PM, welcome cocktails, then dinner to be taken ashore at client expense. Includes breakfast the next morning. 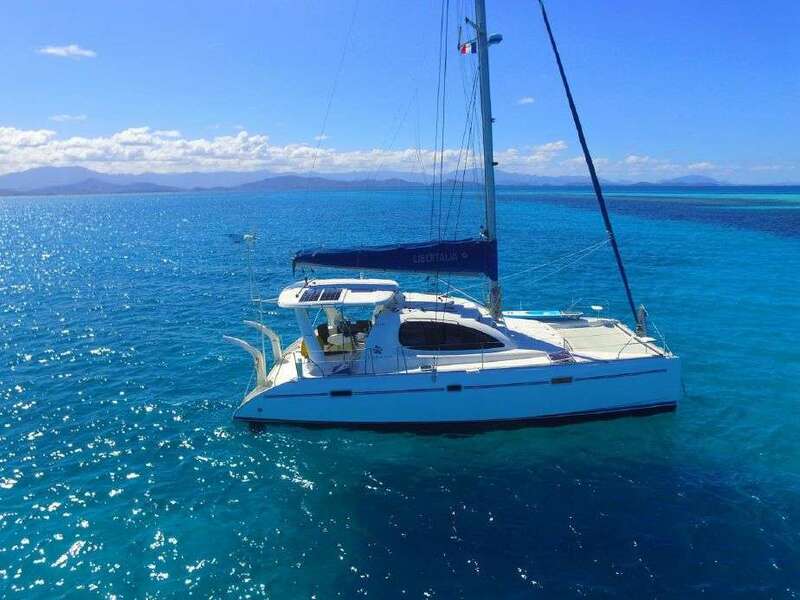 Valid for SIX night charter or longer, 2 cabin minimum and may possibly be on mooring. EXCLUDES: Christmas and New Year’s weeks. Living on the sea is a dream many share. 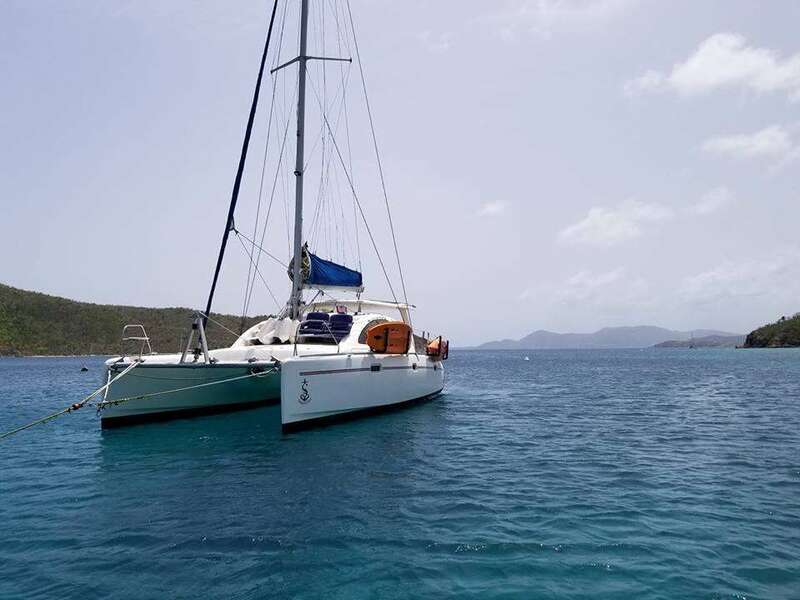 I am excited to have you think of Salty Girl as your home on the water and sail with us. My world was not always water based, as my youth was spent in the mid-west. However, a move to New York State, after military service and an undergraduate degree in Aeronautics, brought me closer to the Great Lakes and sailing on Lake Champlain. Tresa and I grew to believe a 4 month sailing season was just not enough. No matter what month you choose to visit the Virgin Islands, you will find pleasant weather and turquoise seas. Although not unheard of, I hold 2 Licenses; earning not only a US Coast Guard Captains license, but also a Commercial Pilot’s, as well. Sailing and flying are similar. Passenger safety, comfort, and destinations are the focus. Interested in listening to music while swimming? You pick the tunes from our database or Bluetooth from your own playlist. If you would like to know more about boat systems on the ocean, just ask, as I will enjoy discussing them with you. We are proud of our autonomy away from shore. 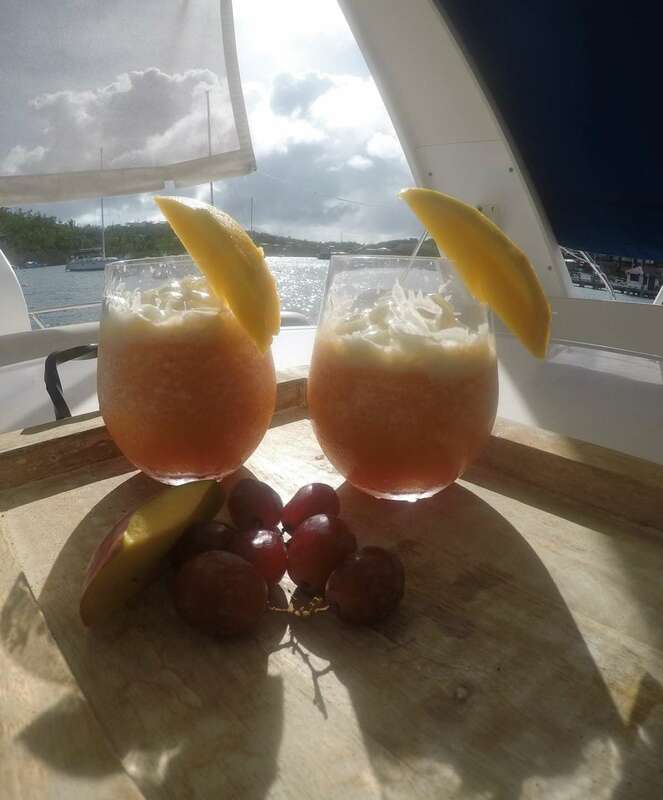 No risks taken with choosing us as hosts for your very special Caribbean outing. We carry “Super Host” status with AirBnb, earned from hundreds of happy guests and their reviews. 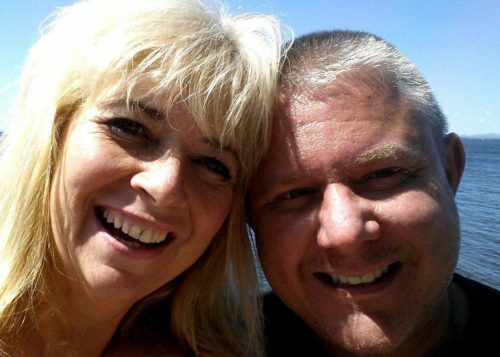 Tresa and Philip have 4 children between them, all in their 20’s and in medical fields. 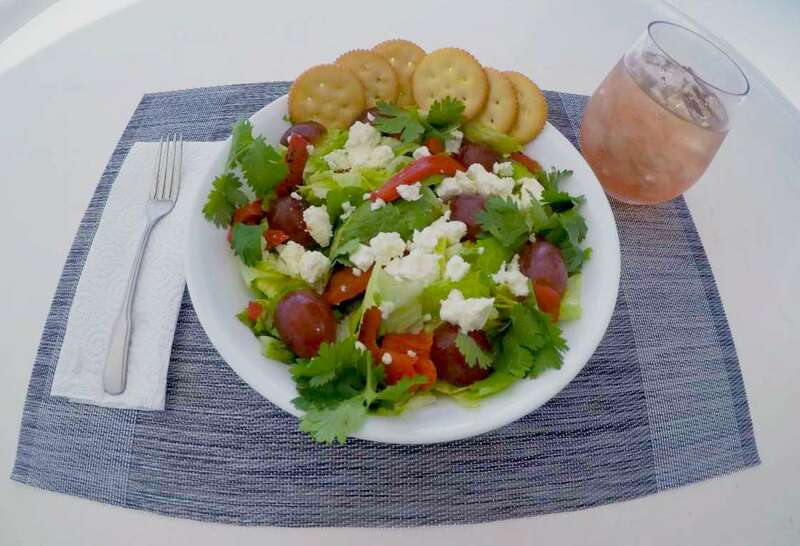 All meals are casual family style meals, made from scratch. “Bento Box” style snack container for hungry guests filled with tasty tidbits such as goldfish crackers, grapes, gummies, carrot sticks etc. Thank you Tresa & Philip for a fantastic 40th birthday adventure! Everything was beautiful, relaxing, delicious and exceed our expectations! We felt at ease from the first coversation on the phone and throughout the entire trip. We would recommend anyone looking for a relaxing adventure. What an amazing week aboard the Salty Girl! We can’t thank you enough for your generosity, hospitality, and for this amazing adventure! Thanks for all the advice and words of wisdom. We hope to be joining you on the high seas one day! Thank you for everything! Unbelievable!!! Thank you so much for such an unforgettable vacation. Everything was so much more beautiful than I could have ever imagined. I’m so glad we had you guys to show us around and cook for us. The food was amazing. I especially enjoyed Salt Pond Bay and Ram’s Head hike. What an amazing experience! We are leaving with full hearts and lots of memories. Your home is beautiful and we are grateful y’all have allowed us to share it with you. Holy moly! Amazing! Loved snorkeling and scuba. The islands, ruins, hikes, kayaking were just what we needed. Thank you for personalizing our trip. Thank you Tresa + Phil! Great experience + great hosts! 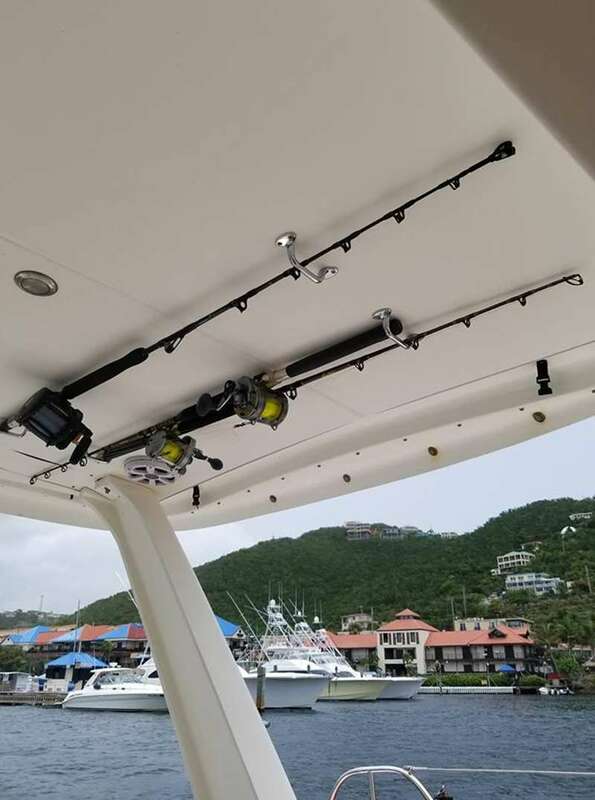 Our third charter trip to BVI and another amazing experience. Such gracious hosts, our every need taken care of with a smile. 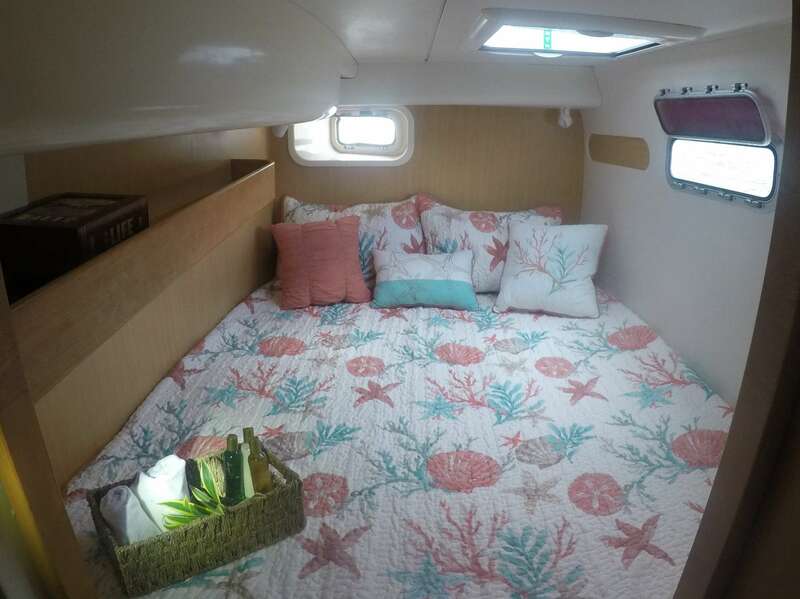 We loved the comfort of the Salty Girl. Great hot showers, fans in the bedrooms, plenty of towels, but most of all Tresa and Philip made us feel like we were sailing with dear friends. So many wonderful meals, laughs and lots of stories told. Thanks! I’m glad you found each other and are living your dream! You have been wonderful guides, hosts and providers. I enjoyed every minute! Wishing the two of you & the Salty Girl many lovely trips. Thank you Philip and Tresa for such a fun afternoon. Your guys were awesome and what a great boat! Thank you for having my family aboard the Salty Girl. Glad I could spend some time with you all aboard your wonderful boat, you two are fantastic. Thank you so much! A fabulous trip-loved it. Thanks for such a good time and fun trip! Loved the trip and look forward to more trips in the future! Trip was fabulous and Philip and Tresa you made it so much fun. Great Day! Thank you Philip and Tresa! You have helped provide my family with many wonderful, lifelong memories. Breyden (8) appreciates and really enjoyed all of the wonderful snorkeling spots. Khloe (7) loved every bit of the charter as well. We all had an amazing experience!!! Thank your Captains Philip and Tresa! Our family came together in closeness on Salty Girl and in ‘the gorgeous Virgins.” Simply relaxing and beauty. 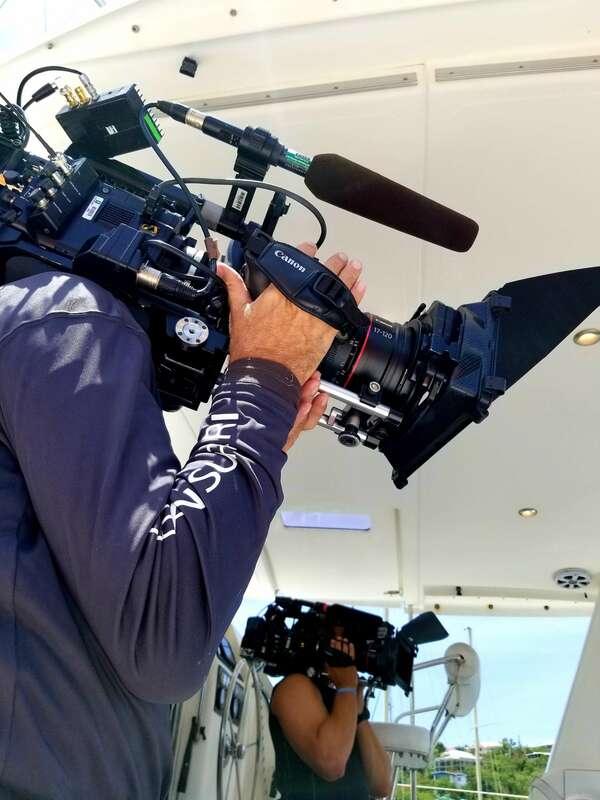 Crew: Philip and Tresa work together as a kind and coordinated team; always focused on safety, but with the special warmth and hospitality. Tresa made the best meals of our trip. (Ice cream, homemade pasta, waffles and my favorite: tuna seared and a delicious salad. My kids (17, 19, 20) gobbled up everything too. 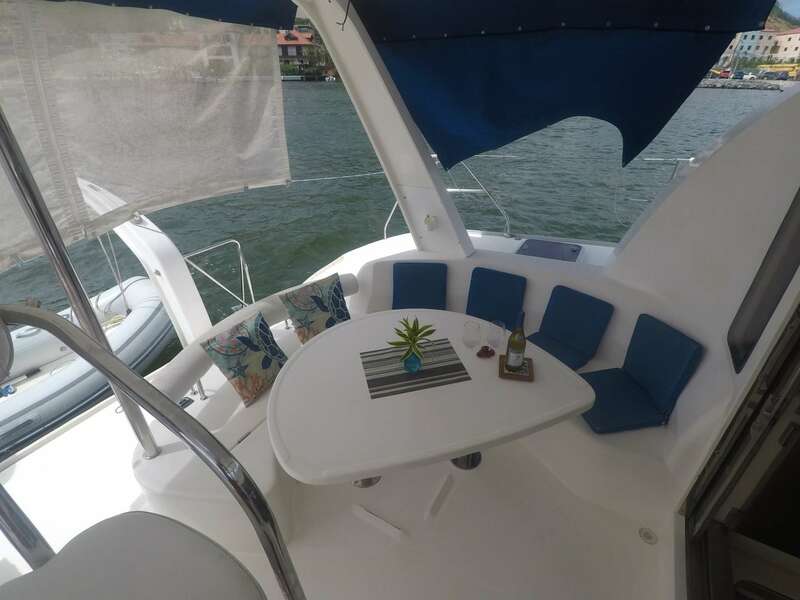 Salty Girl: There are surprisingly many places for a family of 5 to sit and lounge on this gorgeous and solid vessel. We loved stargazing into the night… shooting stars, satellites and good conversation. Tresa and Philip were very knowledgeable and fun to be around. We had a great itinerary for us and the kids, we felt very safe and we had an amazing time! Thank you for a wonderful, peaceful, never to be forgotten day. The company was amazing and you made us all feel right at home. The food + drinks + cookies were delicious. The conversations were educational and the family gathering with friends included will always be unforgettable. You both are the greatest hosts and looks after our every need. The seal was healing, beautiful and called to us. It was an amazing adventure to last a lifetime. We will be back… time & time again. We are so grateful for a most perfect day. Thank you for being such amazing hosts! Salty Girl is going to be a big star! We are so glad you took us out on the water. It makes us happy to know our show, Caribbean Life, changes lives and helps people live out their dreams. YOU are helping US live out our dreams! Thank you for an amazing day on the Salty Girl. 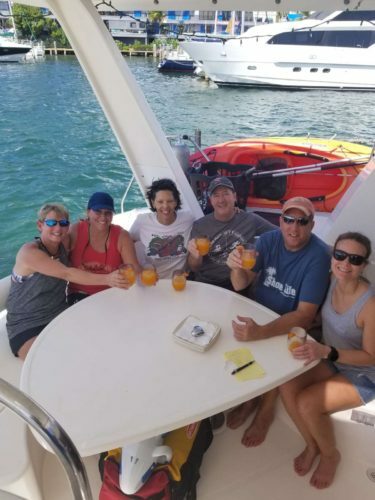 The most amazing snorkeling and sailing tour as well as the most kind individuals you will ever meet. The knowledge that you both passed on to our family about the ocean and the islands was remarkable!! We will never forget this once and a lifetime, as a family, chance to explore with you guys. Wow! From the initial talks to the very first step aboard this trip. Our first island hopping trip was utter perfection! 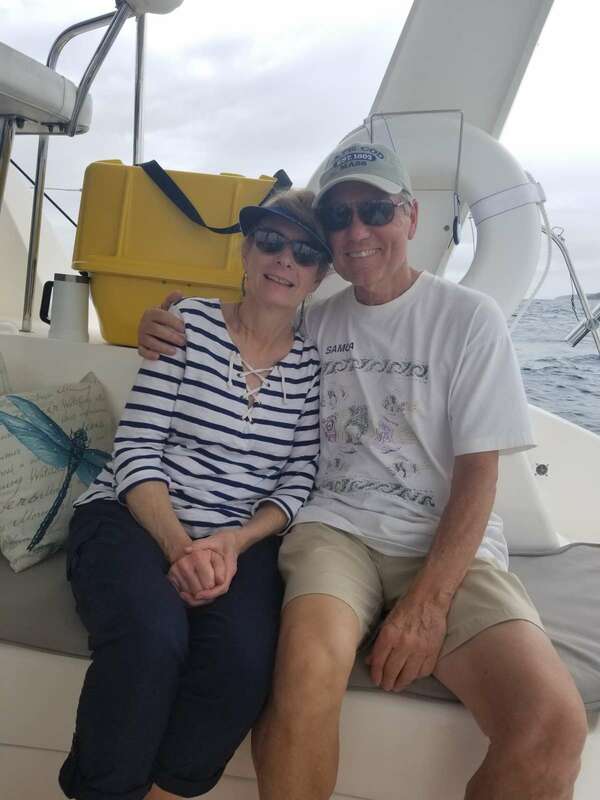 Philip and Tresa are both amazing captains – they saw to our every need and paid close attention to every desire. We saw NINE islands – the food was fabulous. Homemade BREAD AND PASTA – even homemade ice cream, We were served in high fashion and felt like Royalty! Such an amazing time on the Salty Girl. Memories of great friends, unbelievable water and stops along the islands. Special thanks to Tresa and Philip for the awesome ride. Food was off the chart! Tresa and Philip are phenomenal! A dear friend and I enjoyed our cruise around St. John. 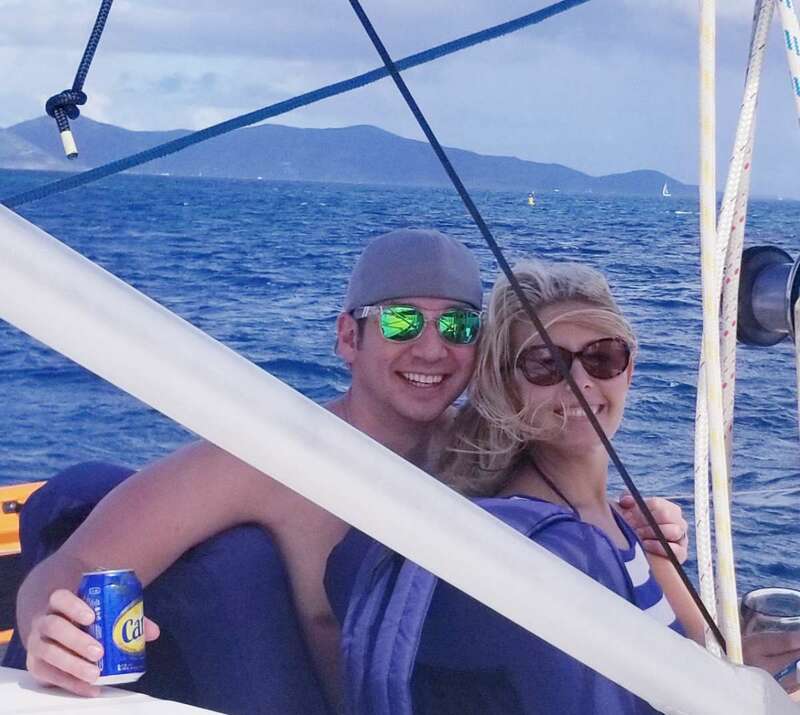 Tresa and Philip added immeasurably to our introduction to the Virgin Islands, snorkeling, and turtles. Thank you for an amazing experience. My cheeks hurt from smiling! This was our first 5 day private charter and it was a dream come true. The two of us for this cruise, and there is so much room four more could have been with us easily. The boat is Spotlessly clean and very experienced crew, safety is always first. We visited 5 bays and snorkeling is perfect, the water is like glass. Each night the back water lights were light and the fish swarmed to the boat. Equipment was plenty and in excellent condition. This crew knows all the good places to visit and see turtles. Meals are prepped on the boat and made from scratch. No one, young or old will ever be hungry on this cruise. Every meal is freshly made each day. The best meal is the Linguine and white sauce is haven. 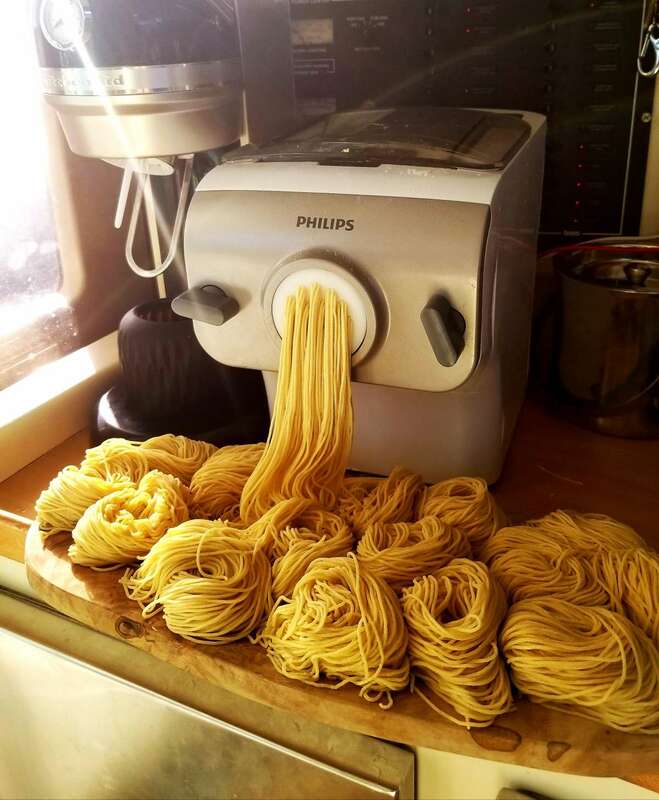 She makes the noodles and sauce on board that day. Every meal is wonderful and a heavenly experience. This crew can take you to the right bay to find that special gift for the Family members and mother in law. Maybe visit the floating bar with music. We could not ask for a kinder host and thoughtful crew (Army Family) of two. Everything is perfect and thought out. We will return. Thank you Salty Girl for the priceless, precious memories for our family. We could not have planned a better family vacation. Looking forward to another adventure with you soon! Sailing into paradise with the best crew ever will not be forgotten! Thanks for sharing your home with us for the week. What wonderful way for us to celebrate our family milestones! It was wonderful to see how the islands are bouncing back from the hurricanes. Scenic views from land and sea will be in our memories forever. 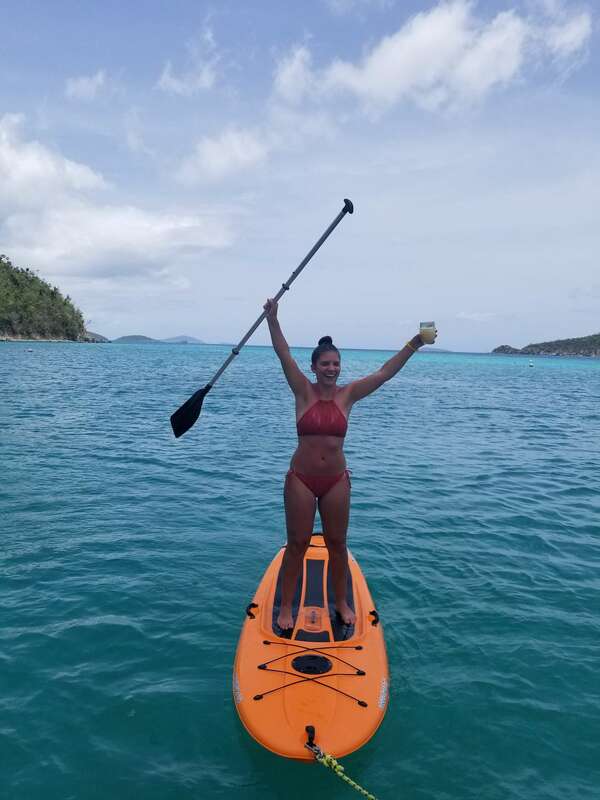 We particularly enjoyed our time at Trunk Bay, The Baths, The Indians and Caves, and of course, the Soggy Dollar on Jost Van Dyke. 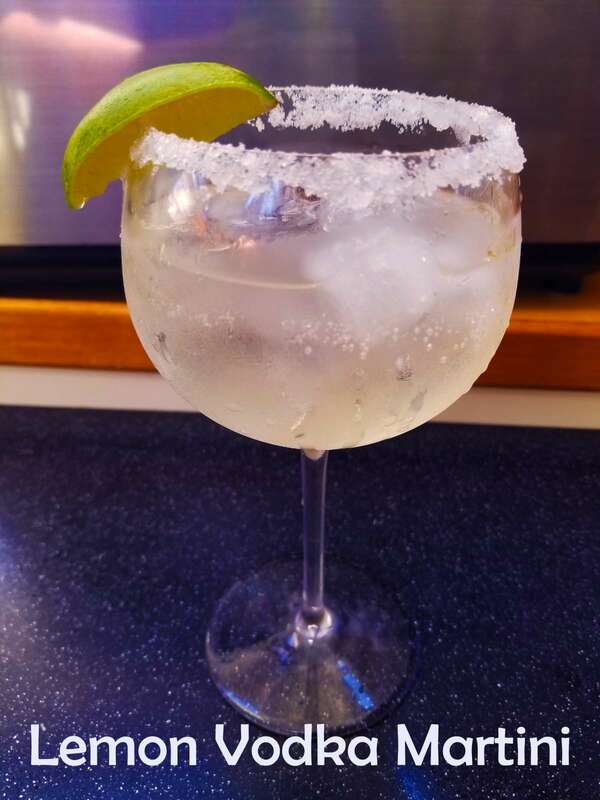 Salty Girl Charters and Philip and Tresa know how to do it right. Great company and the ease and flexibility of being able to do whatever you want to do at your own pace is wonderful. Soak up the sun and do nothing, or swim, snorkel, fish and play on the sub-wing…it’s all good with these two. Salty Girl is the way to go. 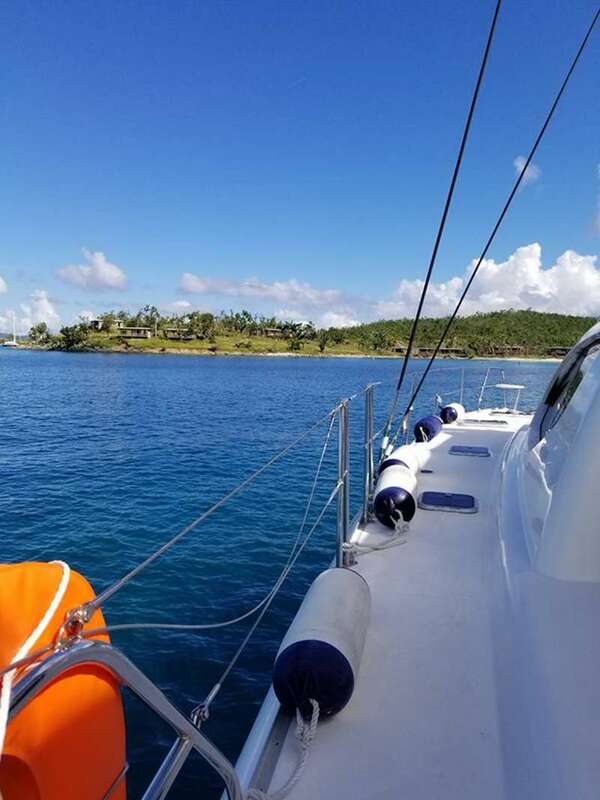 My wife and I chartered Salty Girl in April of 2018. We loved the adventure. Captain Phillip and Captain Tressa were fun and easy to be around. We had many memorable adventures on this outing. 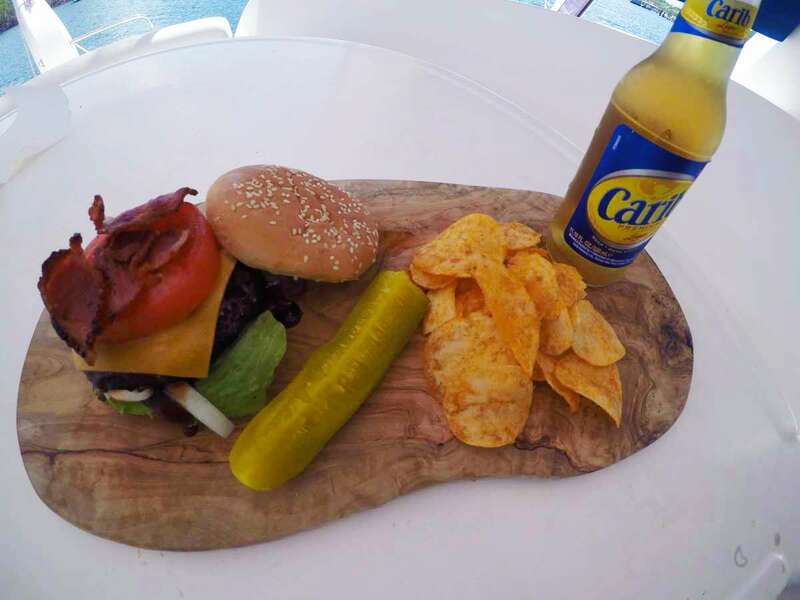 The food was great, the scenery was remarkable, the snorkeling was a blast, and learning about the Caribbean was interesting. Anything we decided we wanted to do was arranged by our captains and we enjoyed every bit of our trip. I had never been on a cruising cat and was very happy with the introduction provided by Captain Phillip. We have relived this trip over and over as we shared it with friends and family. Incredible day sail on SALTY GIRL yesterday with top notch Captains Phil & Tresa. Tresa was on time picking up myself and my 2 nephews Matt & Dave at Fishtails dingy dock in Red Hook! 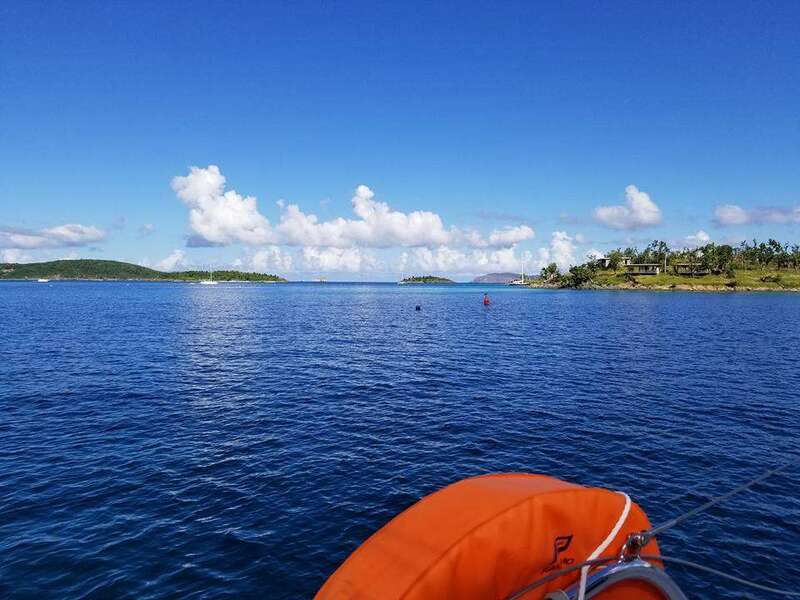 We sailed over 20 miles around the islands then we snorkeled at Caneel Bay off St. John. Also had a blast with the SUP & Kayaks that the provided for us. Lunch was very delicious (loaded nachos) and conversation with the Captains was great! I highly recommend this team and there very clean vessel. Philip and Tresa were very welcoming and did everything they could to make my stay comfortable and enjoyable. The bed is very comfortable, the room and house are clean and pleasant, and it was a most enjoyable stay for me. I would be happy to come back and stay again. Philips and Tresa were wonderful. They were understanding when I checked in late. The room is warm. The bed is foam with tons of pillows, and they serve drinks and snacks for late-arriving, hungry travelers like myself. They are gracious and kind hosts and I would make it a point to stay with them again. I really enjoyed my 5 days stay here. Philip and Tresa are great hosts. They made my stay really comfortable. The wifi is great so I can do my work during my stay. You get a lot more for what you pay for. I won’t hesitate to recommend this place to everyone else.